Skinners have been around for a while. As they say, "The Skinner’s mill has been a traditional part of the Suffolk landscape since 1688. 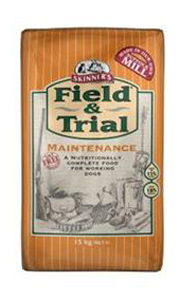 "The Mill has belonged to the Skinner family for seven generations, but it was the idea of the current Chairman, Roger Skinner, to branch into complete dry dog foods in the early 1970’s – a time when there were very few competitors in this sector of the market. "The manufacture of complete dry dog foods was a natural progression from animal feed compounding, and with an excellent reputation already well established the move proved extremely successful." There's a range of foods in the Skinners brand, some more 'natural' than others, but if you look hard enough you will find something to suit. 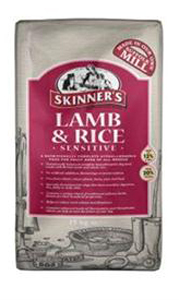 Skinners try to please everyone, so at the bottom of their range is the Field and Trial Maintenance, which is a very basic food, and up the ladder is their excellent Sensitive range of natural food. Skinners food is quite competitive at both ends of the market. Expect to pay £17.50 for a 15kg sack of the basic food, which is cheaper than such as Pedigree, and £32 for 15kg of the Skinners Sensitive food. Based not just on quality of ingredients, but if it seems to offer value for money - and this is for the Sensitive range!